The International Coastal Cleanup (ICC) is a global movement celebrated every 3rd Saturday of September yearly and being participated by more than 100 countries across the globe including the Philippines, as we rally the community towards a common goal of collecting and documenting the trash littering the coastline. 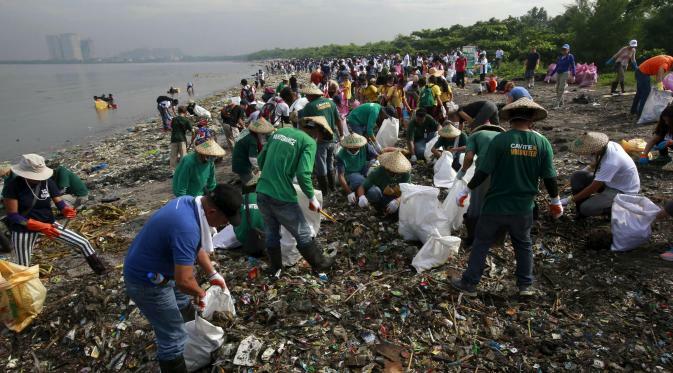 In 2017, the Philippines ranked #1 with the most number of volunteers, but on the contrary, the country is ranked #3 as the biggest dumper of plastics in the ocean. According to the Ocean Trash Index, the world's largest item-by-item, location-by-location database of trash found in near-shore environments as a result of the data submitted by all the volunteers of ICC, plastic debris remains a growing concern in the marine environment, and the top five most commonly collected items are cigarette butts, food wrappers, plastic beverage bottles, plastic bottle caps and plastic grocery bags, respectively. The trash data collection is important because it will help governments, manufacturing industries, businesses and individuals in making smart solutions to the marine debris problem. As we participate for this year’s International Coastal Cleanup activity scheduled on September 22, 2018, we encourage everyone to participate in the data gathering efforts so we can have a better assessment of the trash in our area. There is an increasing need to address this issue of marine litter and beach cleanup alone is not enough​. 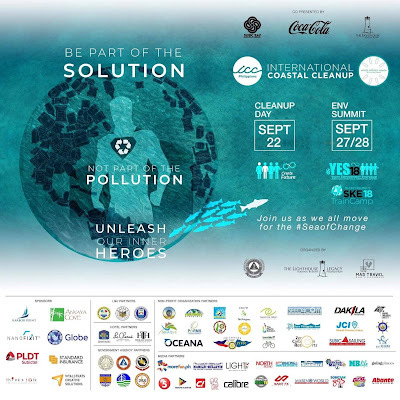 The highlight of this continuous effort is the ICC ENVIRONMENTAL SUMMIT​, a supplement to the annual beach cleanup that will take place on September 27 and 28, 2018 at the Subic Bay Exhibition and Convention Center (SBECC)​. This year we are launching the Youth Empowerment Symposium (#YES18) as we focus on empowering our youth by tapping into the best practices of top Filipinos and global organizations, inspiring our next generation of leaders to follow-suite and provide the tools that they will need to continue our quest towards a more sustainable future. Together, they can come up with viable solutions for pressing environmental matters and approach new, peaceful and constructive ways of problem-solving. This will be the 4th Summit that will be held in Subic Bay and has always been focused on the new generation - millennials, the most powerful force of our future. If we want to change the world for the better, there has to be a change in people’s behavior. And this year’s theme is “Change Heroes​” a challenge for the youth to be an instrument for change, to spark social consciousness formation towards social change, changing the way we view the world, unleashing our inner heroes, and become better builders of our nation. 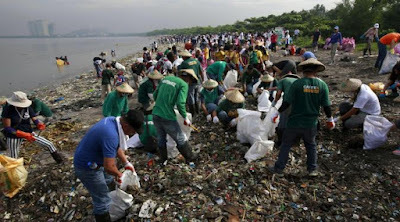 It will be a symposium participated by youths, mainly the newly elected SK officials from Olongapo, Zambales and Bataan together with experienced executives and organization leaders that will focus on finding more efficient solutions to ensure that the cleanliness of our beaches will continue far beyond the cleanup activity. This event is organized by the Lighthouse Marina Resort Legacy Foundation, Make a Difference (MAD) Travel and the Philippine Coast Guard Auxiliary; co-presented by Coca-Cola Philippines, Subic Bay Metropolitan Authority, The Lighthouse Marina Resort and Globe Telecoms as the official connectivity partner; in cooperation with the Philippine Alliance for Recycling and Materials Sustainability, Subic Bay Freeport Chamber of Commerce, International Yachting Fellowship of Rotarians, Miss Scuba Philippines, UP Marine Biological Society, Dakila, Seed4com, and Oceana Philippines; supported by Provincial Government of Zambales, Municipal of Olongapo, and Provincial Government of Bataan, Department of Environment and Natural Resources, National Coast Watch Council, Department of Tourism, Philippine Coast Guard, PNP Maritime Group, Department of Interior and Local Government, and the National Youth Commission; sponsored by Ayala Harbor Point Mall, Anvaya Cove, PLDT Subictel, Think + Talk Creative Communications, VitalStrats Creative Solutions, Standard Insurance and Nanofixit.